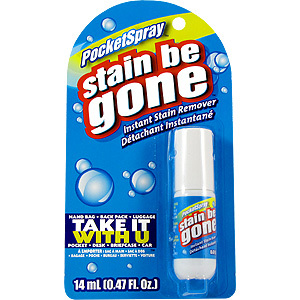 Stain Be Gone PocketSpray is an instant stain remover that fits anywhere from your pocket to your desk and even your briefcase and car! 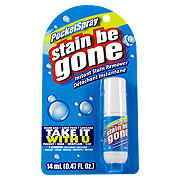 Use on hard to remove stains such as: Grass, Food, Coffee, Blood, Dirt, Grease & More! Step 3: Blot to remove excess moisture with a paper towel or dry cloth. No more stain! For Best Results: Treat stains while they are fresh. If possible, place a dry cloth or towel under stain while treting and remove excess moisture by blotting with dry cloth or paper towel. Always test on a small inconspicuous area first before using. Caution: Eye irritant. In case of eye contact, flush eyes with water for 15 minutes. If irritation occurs consult a physician. I carry one of these around everytime me and my family go out somewhere nice to eat. When someone gets something on their shirt I go ahead and clean it up real quick. It dries quickly and the stain is gone! I was out on a date with a really cute guy that I really got along with. We were out on dinner and I accidentally spilled a little bit of tomato sauce on my dress. Luckily I had one of these laying around my purse. I excused myself to the restroom and started spraying it. A few minutes later. The stain was gone. As if it were never there! I had a good night after that! 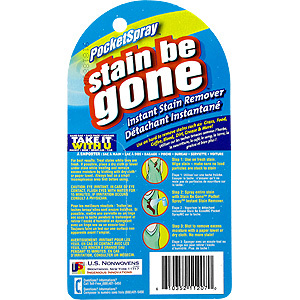 PocketSpray Stain Be Gone is shipped in a discrete, unmarked package. Orders are processed immediately and usually take about 3 to 5 working days to be received. We do ask that you try it for 2 to 3 weeks to feel the full effects. Any information received is used only for order processing and shipping purposes. Your information, such as e-mail address, will never be disclosed to a third party.